One half of a legendary half back partnership, Ken Catchpole is widely acclaimed as one of the greatest scrum halves to come out of Australia. Catchpole's combination with fly half Phil Hawthorne laid the foundation for many historic victories during the 1960s. Their performances for Australia against South Africa in 1965 and in victories over Wales and England on the 1966/7 tour to Great Britain in particular personified the champion partnership. Catchpole made his Wallabies debut aged 21 in 1961 against Fiji in Brisbane, becoming the 455th player to represent Australia. Unusually he was named captain despite his lack of international inexperience and young age, becoming just the ninth player to make their Test debut as captain. Born in Paddington, a suburb of Sydney, in 1939, Catchpole rose through the ranks of club rugby. He played for Randwick Under-21s before breaking into the senior team. He made his first of 26 appearances for New South Wales against the British and Irish Lions in 1959 as a teenager. It took Catchpole two years to establish himself as Australia's starting No 9 and after making his debut in the Three-Test series against Fiji, he captained the team to South Africa that same year and again in 1963. It was while he was in Britain that Catchpole went some way to earning his legendary status. After a record victory against England - the 23 points scored by the tourists was the most England had conceded at Twickenham since the first international at HQ in 1910 - the President of the English Rugby Union described Catchpole as "the greatest halfback the world has known". Catchpole scored a late try against England although at the time he did not rate it as one of his best. "I don't think it was one of my greatest tries," he said. "I received the ball from Phil Hawthorne and the line was beckoning with scarcely any defensive cover in sight." Hawthorne himself created a little bit of history in the game by scoring three drop goals, becoming only the second player after Pierre Albaladejo of France in 1960 to achieve a feat that has since been equalled or bettered by a raft of players, but at the time stood out as something rather special. Catchpole had a controversial and premature end to his career. He suffered a severe injury during the second Test against New Zealand in 1968 when Colin Meads, in an effort to clear out a ruck, grabbed Catchpole's leg and wrenched it while he was pinned underneath other players. His hamstring was torn from the bone and his groin muscles severely ruptured an injury that ended his career. 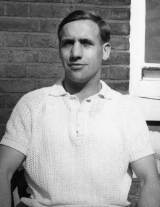 Catchpole played 27 Tests for Australia, captaining 13 from 1961-68. He was inducted to the Twickenham Hall of Fame in 2004 and with several other legendary Wallabies from across the eras of the game was part of the inaugural intake to the Wallaby Hall of Fame the following year. His name also adorns the Ken Catchpole Medal that is awarded annually by the New South Wales Rugby Union to the best club player in the state.